Their designers set out to craft an entry-level deckboat that gives families everything they want and more. 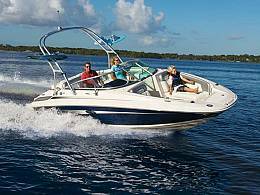 The new 210 Sundeck boasts more versatility, more storage, more performance, more everything. Trick it out with a water sports tower, blue cockpit lights, upgraded stereo and hull graphics. Now we're talking serious family fun. Forward-facing seat converts to a lounger on portside. Bow block-off door under windshield. Standard bimini top with stainless-steel hardware. Matching tandem-axle trailer with surge brakes and swing-away tongue. Available in black, red, blue, burgundy, and pewter optional two-tone gel-coat finish with Sundeck graphics. Sea Ray Owners Club� membership.